No! Vaporizers are not always safe! Even though vaporizing in and of itself is a much better option health-wise than smoking, this only holds true IF you use the right vaporizer. You can damage your health with heavy metal poisoning and other types of poisoning if you get the wrong vaporizer. Unfortunately not every manufacturer has your health as a top priority. Short term profits sometimes trump ethics, also in the vaporizer industry. But after reading today's post, worries about wrecking your health with a dangerous vaporizer will be something of the past. I'm going to exactly show which parts of a vaporizer have the potential to put you in a hospital bed and how you can avoid the dangerous AND get the safest vaporizers. Does My Vapor Pass Over the Electronics of My Vaporizer? Being the most essential part of your vaporizer, the heating element has the most impact on the safety of your vaporizer. This part of your vaporizer gets the hottest and has the biggest potential to give off toxic fumes when low-quality materials are in it. Trust me…you really don’t want to be inhaling fumes with lead or mercury particles. AVOID no-name and imitation vaporizers (a lot of these are manufactured in China and sold on websites like aliexpress.com, alibaba.com, ebay.com and other action-/wholesale-type of websites). 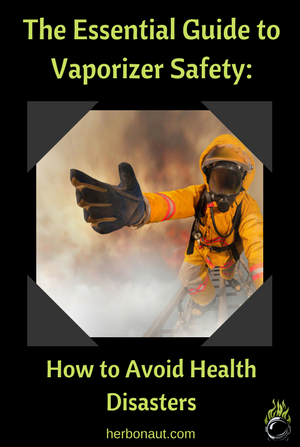 …and you are vaporizing to save your health, not to inhale toxic fumes created by a sub-par heating element. The most simple way to avoid issues like this is to only buy from reputable brands and their authorized dealers (if you have any doubts, please contact us and we'll do our best to help you assess whether you're making a responsible choice). You can rest assured any vaporizer that you find on Herbonaut has a good and safe enough heating element for anyone but the paranoid (in a good sense!) among us. If you are a little paranoid read below for the most up-to-date facts about materials used for heating elements and their safety implications. Aluminum heating elements are extremely precise in their temperature control. Some of the best vaporizers like the well respected Volcano make use of an aluminum heating element. Storz and Bickel actually proofed this in an independent technical test with their Volcano Vaporizer. There have been studies which have shown cookware made of low-quality aluminum does leach off at least some aluminum when it comes in contact with acidic products, even though it stays under the boiling point. Now, is this translatable to vaporizers? Resin (the left-overs of your herb that clog the vapor path of your vaporizer) is acidic after all. Just because the aluminum heating element of the Volcano is safe, does not mean aluminum heating elements of other vaporizers are safe as well. Only if it comes from a reputable and transparent company. Ceramic heating elements are often advocated by manufacturers who use them as the safest. And while it’s true that pure ceramic can withstand temperatures up to 1648°C / 3000°F, vaporizers rarely reach a temperature higher than 240°C / 464°F (the combustion point of cannabis). A ceramic heating element has a higher Max-temperature before chemical erosion occurs than aluminum and therefore is safer! Does not hold much ground when the maximum temperature reached is well below the critical melting point/boiling point of the material anyway. Besides a lot of ceramic heating elements are made of Alumina (Aluminum oxide). 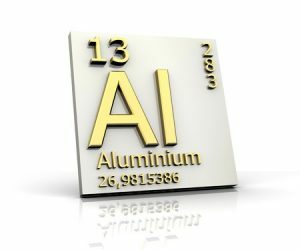 Although having a much higher boiling point, Alumina has the same potential to leech off unwanted substances as regular Aluminum…when of a low enough quality. In other words: ceramic isn’t necessarily safer. Also, be very careful of manufacturers and sellers who advertise the heating element of their vaporizer as ceramic when there’s only a very small ceramic part in the element! To avoid issues like this, only buy from reputable brands and their authorized dealers. Pure ceramic is safe as a heating element, but not necessarily safer than other types. Borosilicate glass heating elements are rare and usually are aluminum or ceramic heating elements covered in a glass shell. Glass does offer an extra layer of protection. Besides, it is the best material to preserve the taste of your herb and is totally eco-friendly. Besides having a big impact on the taste of your vapor, the air path is another part when designed poorly, has the potential to damage your health. 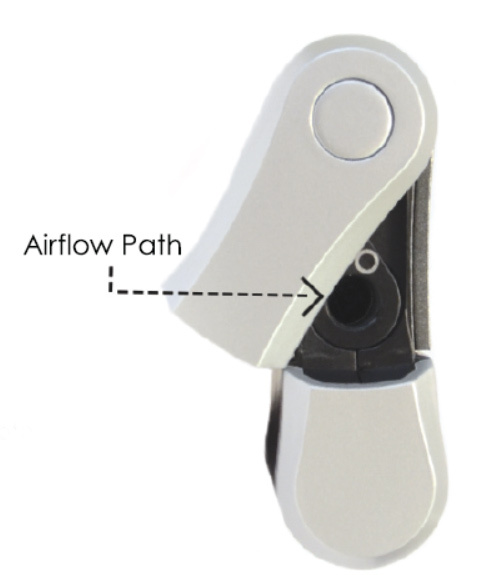 The air path is the path the air travels from the moment it starts getting used in your vaporizer (this is even before the air heats), to the moment it starts filling your airways. The vapor path is something slightly different: it's the path your vapor travels from the moment it starts getting produced to the moment it starts filling your airways. The air path is longer. This is because your vaporizer has to pull in air from outside and heat it before it can produce vapor. The path the air travels before it starts heating your herbs is what makes the air path slightly longer than the vapor path. The path the air travels before it starts heating your herbs is important for your safety as well. Although it's just cold air, particle pollution can occur during this stage as well (small toxic particles can mix with the air, even though it's cold). And what happens when these small toxic particles are part of the vapor you inhale? This all depends on what exactly you're inhaling and the quantities that you're inhaling, but it probably won't be good for your health. Particle pollution occurring in the air path before it reaches your heating element is less likely. These materials are of a high enough quality that no chemical reaction occurs when they come in contact with the hot air that gets directed through the vapor path. A borosilicate glass air-path would be your best option from a safety standpoint, but also from a vapor quality standpoint! Glass, in general, is the most inert material of these 4 (check out this study for example) and any chemical reaction occurring from the hot air that passes through it is zero (0). Glass doesn’t absorb anything either. It's no coincidence that the pharmaceutical sector puts full faith into glass to protect products from contamination. 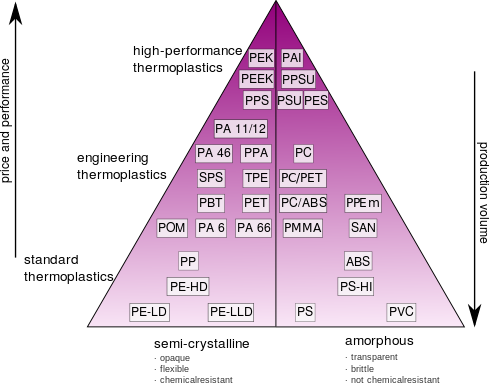 Between the different types of glass, borosilicate glass is best because it's even more chemically resistant to acids. On top of these qualities, borosilicate glass is extremely heat- and thermo-shock resistant. But even regular glass is better than most other materials in a vaporizer. Really, an all-glass air-path is what every vaporizer SHOULD have. Stainless steel, when of the right type (type 304 and 316) is highly resistant to corrosion and is food-safe. What this means is these types of stainless steel are perfectly safe to have in your vapor path (even though stainless steel is less inert than glass). Some studies have shown stainless steel cookware can give off nickel and chromium when it comes in contact with acidic foods, however, the quantities were way below the daily maximum intake. To be completely safe, just make sure you regularly clean your stainless steel parts. Don't let resin build up and give acid room to do its corrosive work. But to me, plastic pieces in my vapor path does sound fishy. Plastic does have a bad name in general and some types of plastics are definitely not suitable in a vaporizer. We personally at Herbonaut don’t like Vinyl whip tubing for example, because it’s made from PVC plastic. Even though any PVC/Vinyl whip that comes with vaporizers like the Da Buddha Vaporizer or Silver Surfer Vaporizer does get advertised as food safe, PVC is actually one of the most toxic plastics. But also the plasticizer material DEHP that's being used to soften PVC, has adverse effects on the male reproductive system of rats! What I recommend instead, is get a food/medical grade silicone tubing like this one. If there’s any plastic around the heating element, make sure it’s heat resistant to temperatures above regular vaporization temperatures (up to 240°C / 464°F). Also, make sure you regularly clean any plastic and give acidic resin build-up no chance to corrode anything. Silicone pieces in your vapor path will mostly be present if you’re using a whip. Again, a silicone whip is perfectly fine, as long as you have medical/food grade silicone (like this one) and don’t let any herb resin build up by regularly cleaning it. High-quality silicone is heat-resistant, so there's no need to look for especially heat-resistant silicone. 3. Does My Vapor Pass Over the Electronics of My Vaporizer? There have been concerns about air passing over the electronics used in vaporizers. One example is the Arizer Extreme Q, it has been shown cold air passes through the electronics before it gets heated by the heating element and directed through the vapor path. A lot of electronics contain heavy metals and other unsafe materials for inhalation. You definitely don't want to be inhaling heavy metal particles in large quantities for example. I'm not saying you are inhaling dangerous particles when you use a vaporizer like the Arizer Extreme Q. And if you do, they might be well below safety limits. You could be inhaling unwanted compounds, and just because there are no known issues yet, it doesn’t mean there aren’t any. If you want to take maximum precautions avoid the Arizer desktop models like the Extreme Q and V-Tower. Except for the Arizer Solo 2, the Arizer portables seem to have an air path separated from the electronics. The whole vaporizer- and quit-smoking-industry jumped on the bandwagon and started advocating that vaping with electronic cigarettes was THE way to quit smoking because supposedly it was 95% healthier than smoking. And all this was based on 1 study! Over the years, more and more research has poured into determining ALL the effects of electronic cigarettes. There are several studies which point to the fact that e-liquids used in electronic cigarettes can be unhealthy for your health. To stay safe if you're an e-cigarette user, it's important to read up on all the vaping health risks. Luckily, a lot of them are preventable with high-quality vaping gear and proper vaping techniques. Electronic cigarettes and e-liquids are not always safe and I recommend to do your due diligence on the products you plan to use before you start vaping, by reading our e-cigarette articles. You learned vaporizing is only healthier than smoking if you use a high-quality vaporizer. What is a high-quality vaporizer? Any vaporizer from a reputable brand and authorized dealer qualifies as proper, but we reviewed the best ones here. Some of you need extra assurance and want to absolutely minimize health risks. To understand how you can get this extra assurance, you learned what type of heating elements and air paths are the safest. If you enjoyed this post and want more, follow us on Instagram or become a fan on Facebook and click share to look like the most intelligent guy/girl in your social circle.